Production of exopolysaccharides by lactic acid bacteria is a common phenomenon. Structural information of these widely diverse biopolymers is rendered by the monosaccharide composition, the anomeric configurations, the type of glycosidic linkages, the presence of repeating units and noncarbohydrate substituents, and finally the presentation of a chemical molecular structure or composite model. The detailed structural analysis of polysaccharides is a time-consuming pursuit, including the use of different techniques, such as chemical degradation methods (e.g., hydrolysis), separation methods (e.g., SEC-chromatography and HPLC/HPAEC), and identification methods (e.g., GLC-EIMS and 1H/13C NMR spectroscopy). 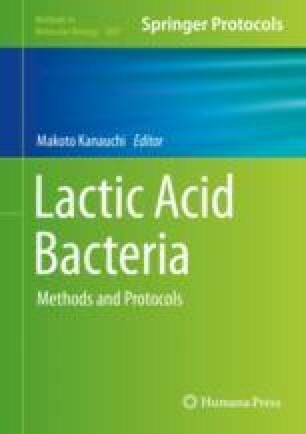 In this chapter, some analytical methods are described and demonstrated for two different exopolysaccharides from lactic acid bacteria.